Los Lonely Boys are an American Grammy-winning musical rock band from San Angelo, Texas. They play a style of music which they dub as Texican Rock n’ Roll, combining elements of rock and roll, blues, soul, country, and Tejano. Their influences include Stevie Ray Vaughan, Santana, and Ritchie Valens. The group frequently headlines tours, and has also performed with music legends such as Willie Nelson, ZZ Top, The Rolling Stones, Tim McGraw, Ronnie Milsap and Carlos Santana. Their most recent tour included shows with the Doobie Brothers, Indigenous, and The Rolling Stones. Moving to Nashville in the 1990s, the three brothers emerged as a group and, after moving back to Texas, recorded their debut album in 2003 in Austin at Willie Nelson’s Pedernales recording studio. The album was initially released by Or Music and later acquired by Epic Records for distribution in March 2004. The group’s single, “Heaven”, reached #1 on the Adult Contemporary chart, and #16 on the Billboard Hot 100; crossing over even to the Hot Country Songs chart, where it peaked at #46. The song won the Grammy Award for Best Pop Performance by a Duo or Group with Vocal in 2005. In 2005, the group recorded an earlier song of theirs, “I Don’t Wanna Lose Your Love,” with Santana for his album All That I Am. More Than Love was nominated for a Grammy for 2006, as was Onda. The Sacred CD features the song “Outlaws”. In a very interesting “closing of the circle”, Enrique Garza Sr., sings the verse about the “missing outlaws, just like me”. Willie Nelson, (who is credited on the 2004 album) also provides a verse which makes reference to his hit, “On The Road Again”. 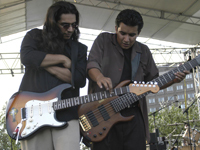 In 2007, Los Lonely Boys participated in Amnesty International’s “Make Some Noise” project. Their cover of John Lennon‘s “Whatever Gets You thru the Night” is the second single from the “Instant Karma: The Amnesty International Campaign to Save Darfur.” The song released on iTunes April 17, with the entire album available on June 12 courtesy of Warner Bros. Records. “Whatever Gets You thru the Night” is noteworthy as John Lennon‘s only US number one solo single while he was alive. 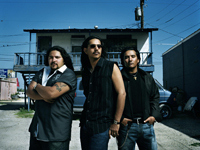 Los Lonely Boys finished recording their third album, “Forgiven”, in February 2008 at East Side Stages in Austin, Texas. Steve Jordan produced the album and it was released July 1st. On October 23, 2008, Los Lonely Boys sang the US National Anthem to open game two of the 2008 World Series in St. Petersburg, Florida. Dr. John appears on three of the tracks on “Forgiven”. The first single “Staying With Me” was released in Early May to AAA radio and continues to be added to more stations weekly. In July of 2008 the Garza brothers will once again embark on their ongoing Brotherhood Tour, this time adding LA’s prodigal sons Los Lobos to the lineup.